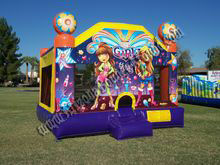 This Girly Bouncer has beautiful art work and will be a big hit at your party without being to Princessy. Perfect alternitive to a princess party. 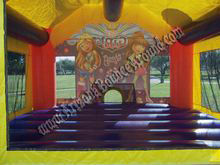 Our Girl Thing Bouncer Rental will be a big hit at your Girl Power party, teen girl party, Princess bouncer party. 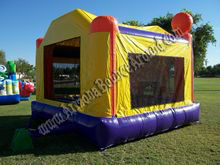 This Girly Bouncer with big bounce area and its beautiful art work will be a big hit at your party without being to Princesses. 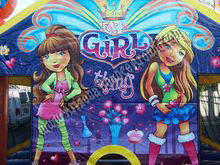 This Girl thing bouncer will fit right in with any girl party. Leave it to Gravity Play Events to have all the unique bouncers including girl Thing themed Bouncers and jumpers.